Our Top 100 Doom Metal Albums of All Time Issue is Back in Stock! 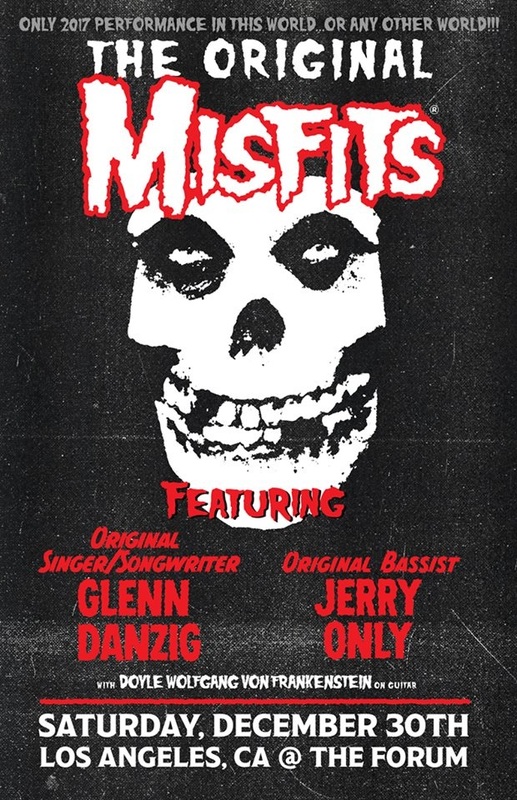 Fan-filmed video footage of the classic-era lineup of the horror punk outfit MISFITS — Glenn Danzig, Jerry Only and Doyle Wolfgang Von Frankenstein — performing on December 30 at the Forum in Inglewood, California can be seen below. MISFITS enforced a strict no-cellphone policy at its reunion shows in Los Angeles and in Las Vegas (which happened on December 28). Glenn Danzig reportedly has a notoriously strict no-photo policy for his concerts, and he has been known to personally enforce it over the years. In 2012, Danzig chased a photographer off stage during his set in Bonnaroo, and in 2015, he put a fan in a headlock after the fan took a picture. MISFITS played two historic reunion concerts in 2016 at Riot Fest in Denver and Chicago that drew rabid fans in droves from all over the world and shattered attendance records at the festivals. After years of bad blood, Glenn reunited with Only and Wolfgang Von Frankenstein for last year’s concerts at both incarnations of Riot Fest in Denver and Chicago. Prior to those gigs, the trio last performed together on October 29, 1983. Joining Glenn, Jerry and Doyle at all the reunion shows so far were drummer Dave Lombardo (SLAYER, SUICIDAL TENDENCIES) and second guitarist Acey Slade. The original MISFITS band broke up in 1983, and Only brought forth a new version of the MISFITS in 1995. Various members have come and gone, but Only, along with BLACK FLAG‘s Dez Cadena, has kept some form of the MISFITS in the recording studio and on the road for most of the last two decades.